Although reconstituted, these potato snacks were crunchy, just like Crisps. A first meaty bite led to a deterioration at a reasonable rate. There were still crispy bits left as the munch ended. The rate of mush varied throughout each individual snack munch. 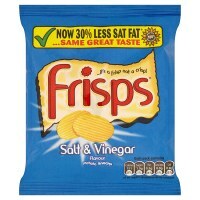 As the pack says, "it's a Frisp not a crisp". This means it is a reconstituted product - that could not look much less like a Potato Crisp. The colouring was very very pale creamy white. The undulations were formed rather than Ridge cut. They were however thickly cut / moulded, whatever. A Nose Plunge Test revealed a slightly smart Vinegar aroma. A Crisp Licka Test revealed a very sweet Vinegar taste. This was replicated by the flavour, which lacked salt, yet left a salty after-taste. The Vinegar dominated, but it was mild and sweet.